The new Ford Fiesta Vignale Hatchback is the range-topping, upmarket version of the Fiesta, a car that remains the benchmark against which all other compact Hatchback’s and superminis will be judged. As ever, the car is lots of fun to drive, affordable to run, and this Vignale version benefits from a swankier cabin and an even more engaging driving experience. Founded in 1899, Ford has had an interesting past. Read our brief article to find out more about Ford’s history. OSV takes a closer look at what it’s all about with our 2018 Ford Fiesta Vignale Hatchback review. The Fiesta has for a long time been the best car to drive in its sector – and it’s now even better. It mixes good ride quality with handling, and it’s super easy to park in tight spots. Ford claim to have dialled its steering back by 20%, which – if you’re into all the engineering stuff – will probably surprise you as most brands are doing the complete opposite. Ford have done this to add more weight which they hope will turn into extra steering feel. Has it worked? The steering is lighter than last time – but curiously, the car is better to drive as a result. You can take the Fiesta out onto open country roads and take corners with enthusiasm because you always know what’s going on. The car’s chassis is a wonderful engineering feat, and there’s more grip on offer than ever before. And while its turning circle isn’t the biggest in this market, a three-point turn is still fairly easy to master. This Vignale variant adds an automatic parking system which makes parking easier than ever, while the brakes have been worked on so that they now have a briefer stopping distance. In terms of its engines, the 1.0-litre EcoBoost petrol engines are really the car’s pride and joy. The smaller of the three variants produces 99bhp and can cover the 0-62 sprint in 10.5 seconds, while the mid-range one develops 123bhp and can cover the same dash in just 9.9 seconds. Rounding off the range is a three-cylinder 138bhp variant that can motor its way from a standstill to 62mph in 9.0 seconds flat. It makes a bit of a noise when it’s worked hard but it’s never annoying – if anything it sounds quite sporty. 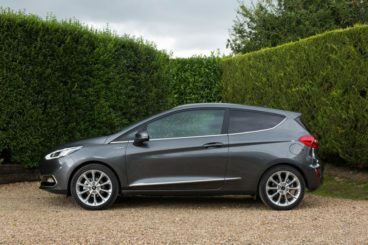 The previous Fiesta did okay on the comfort front, but the latest model is an improvement. And this Vignale trim, with its extra touches of luxury, is an even bigger improvement. However, insulation is a bit of an issue with the Vignale model. The standard Fiesta misses out on the panoramic glass roof, but this highest spec model gets it as standard, and it makes the cabin feel really windy. You can close the glass but it will still feel blustery. Road and engine noise is well-cancelled out, though. Other than that, sporty seats are a highlight, and there’s now more quality inside the cabin than last time. There are lots of soft-touch plastics here and there but buyers will be a bit peeved that the luxury touches of the Vignale trim clash with the harder plastics that are carried over from the lower spec models. We’re sure buyers will like the massive, gloss black surrounded infotainment touchscreen, though. Is the Ford Fiesta Vignale Hatchback practical? It’s now a really useful family car. It’s easy to drive and park, we don’t have too many complaints with visibility, and the fact that the Vignale trim comes with parking sensors and a rearview camera as standard is a massive bonus. There’s more room inside the cabin than last time and a 5-door version is available. Meanwhile, the boot has a load capacity of 292-litres when all the seats are up and 1,093 when you drop the rear seats. Are Ford cars reliable? Read our honest assessment to find out more about Ford reliability. 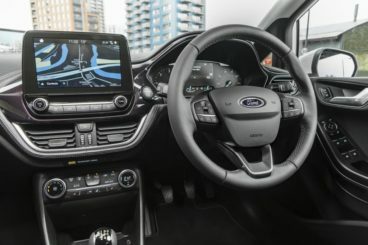 The Fiesta Vignale gets much of the same kit as the standard models, such as a B and Q audio system, an 8” infotainment system, a heated steering wheel, keyless go and cruise control, but it adds to it with access to your own Vignale Relationship Manager, a rearview camera, parking sensors, uniquely styled front grille, bumper and fog lamps, extra chrome inside the cabin, a full-length panoramic sunroof and heated quilted leather seats. Safety-wise, the Fiesta was awarded all five stars when it was crash tested by Euro NCAP. It’s stronger than its predecessor and its standard safety kit includes automatic lights and wipers, cruise control, a driver fatigue alert system, automatic high-beam headlights and traffic sign recognition. In terms of its running costs, the petrol engines are fun to drive and they’ll suit low mileage drivers well. The three-pot 1.1-litre engine is available with either 69 or 84bhp, and both variants are able to return 64.2mpg economy. They also both emit 101g/km of CO2, which gives them an impressive BiK rating of 19%. However, the 1.0-litre 99bhp EcoBoost petrol engine is even cheaper to run. It returns 65.7mpg and emits just 97g/km of CO2. This gives it a BiK rating of 18%. The 123bhp variant of the same engine is capable of the same numbers, but a 138bhp variant’s economy drops to 62.8mpg while its BiK rating rises to 19%. The Fiesta’s driving experience has been getting better year on year for a long time now, and its way out in front of its rivals on this aspect. Heated leather seats and lashings of chrome are just some of the trimmings that the Vignale model grants you. This range-topping model is packed with safety kit. It’s definitely more family friendlier than ever, but rivals are still more usable on the whole. For example, a glass roof limits rear headroom. The biggest problem here is that you’re paying a lot of money for a car that’s certainly got an upmarket vibe to it – but it’s a car that’s still saddled with a few harder plastics. Let’s see how the car fares against its rivals in the comparison section of our 2018 Ford Fiesta Vignale Hatchback review. The new DS 3 is an upmarket supermini that’s practical, great to look at and bursting with character. On the road, the DS 3 is no Fiesta but it’s still engaging and overall pleasant to drive. Its responsive steering is nicely weighted, there’s a good amount of grip on offer and body lean is fairly well resisted. The range-topping sportier versions are the Fiesta Vignale’s direct rivals but they’re not quite as well behaved as the lower spec DS 3 models. Their suspension setup is too firm and the ride becomes rather jerky over rougher surfaces. In terms of its engines, the THP 205 petrol engine is the sportiest in the range. It comes with turbochargers and can thrust the DS 3 Performance model from a standstill to 62mph in 6.5 seconds. Despite those numbers, though, the car never feels all that fast. To enjoy it, you’ll need to be in a good mood because, not only does it need to be worked hard, it also makes a fair amount of noise. If that engine is too powerful for you, you can step down to the PureTech 130 model which completes the same sprint in 8.9 seconds. Running costs? The range-topping model is unsurprisingly the most expensive engine to run. It can return 52.3mpg at best and emits 125g/km of CO2. Those figures aren’t actually that bad when you consider that this is a bit of a bad boy supermini that can whizz you from rest to 62mph in 6.5 seconds. That said, a BiK rating of 27% is steep. Inside, the DS 3 is stylish enough but we wish Citroen had paid a bit more attention to refinement. We can’t argue with the amount of quality on offer, however, and the DS 3 Performance model has a genuinely upmarket look and feel to it. Separating it from the lower spec models are chrome inserts and a black roof, while its other kit includes gloss black interior trim panels and automatic air conditioning. The driver’s position is a tad awkward, especially if you’re taller than average, but there’s lots of modern tech in here, including Apple CarPlay compatibility. 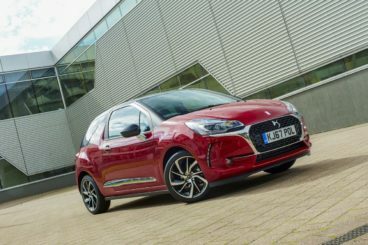 Is the DS 3 practical? The fact that you can’t get it with five doors (unlike the Fiesta and many other cars in this class) is a pretty big drawback but the doors you have at least open wide. Its boot is pretty big too and measures 285-litres, which makes it one of the biggest in this class. Fold the rear seats and you can increase it to 980-litres. Other than that, leg and headroom is a bit poor in the rear and storage solutions are not great. For example, the glovebox is just too small. The new Smart ForTwo Coupe doesn’t look much like the original car but it’s still as easy to park and fun to drive. In fact, it’s better to drive than last time, with the car sharing a few of its rear suspension components with the Mercedes C-Class. This means it’s more comfortable and doesn’t jiggle over poorer surfaces as much as it did last time. It also now sports a rear-engined layout, something it has in common with the Porsche 911. The new model is wider than last time, more stable in bends – but it’s not as sporty as we’re making it sound, with the onus very much on safety first. That said, it does have a very tight turning circle and can outmanoeuvre the London black cab. In terms of its engines, as there’s a third German company that’s got links to the new Smart ForTwo. Brabus has helped with a brand new performance model, which acts as a direct rival to the Fiesta Vignale. It’s powered by a 0.9-litre turbo petrol engine, develops as much as 108bhp, and can complete the 0-62 sprint in just 9.5 seconds. Brabus have tweaked its suspension and steering so that it’s more responsive and sportier than the lower spec models. It still won’t get you hot under the collar, though. Running costs? The 0.9-litre engine is surprisingly economical and benefits from turbochargers on this front. It can return 67.3mp at best and emits just 94g/km of CO2, which gives it a super low BiK rating of 15%. Inside, the new Smart looks and feels better than last time, with the brand adding more creature comforts. The Brabus Sport model that we’re focusing on in this review comes with brushed stainless steel pedals, a sports steering kit, leather seats, as well as a Brabus body kit. Insulation is a bit of an issue, though. You have to work the engine quite hard to get the best out of it, and this does create a fair bit of noise. It’s too difficult for the driver to get comfortable, but one thing that’s definitely worth mentioning is that, with the funky design of the dashboard, this car is definitely aimed at younger drivers. 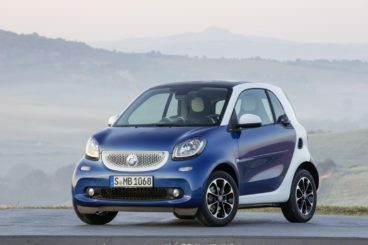 Is the Smart ForTwo Coupe practical? It’s got just two seats which is an obvious setback if you need a car for four people, but it’s very usable for just two adults. Its doors open nice and wide, and there’s more room inside than its looks would otherwise suggest. The range-topping model comes with an adjustable driver’s seat and steering wheel as standard, and the boot measures a respectable 260-litres. It comes with a hidden cubby that offers a further 100-litres of space. Fun for the driver and all the family, the Fiesta is a cracking car. This range-topping version adds a more upmarket vibe to the mix, but the biggest question you’re facing is, Is it really worth the extra cash when the standard model is a belter? The Ford Fiesta Vignale Hatchback is well worth it if you can afford it. Otherwise, we suggest sticking to a lower-spec model.